Algae are one of the natural materials used to green synthesis of nanoparticles. This method leads to minimize the toxicity of the chemical materials used to nanoparticle synthesis. In this study, zinc oxide nanoparticles (ZnO NPs) synthesized by Sargassum muticum algae extraction used to evaluate its cytotoxicity and apoptotic properties on human liver cancer cell line (HepG2). Trypan blue assay results demonstrate a concentration-dependent decrease in cell viability and MTT assay shows increased growth inhibition in time and dose-dependent manner. In addition, CAM assay confirmed the ability of ZnO NPs to inhibit angiogenesis, but chick morphology (both the CR and weight) was not changed. Apoptotic tests (annexin V/PI and AO/PI) show that green-synthesized ZnO NPs induce apoptosis in all three time points (24, 48 and 72h). Our results confirm the beneficial cytotoxic effects of green-synthesized ZnO NPs on Human liver cancer cell. This nanoparticle decreased angiogenesis and induces apoptosis, so we conclude that these nanoparticles can be used as a supplemental drug in cancer treatments. With the advent and explosive development of nanotechnology in the 21st century, nanoparticles have been used to produce various products, which have led to the introduction of nanomaterials in various aspects of life such as industrial products, environmental materials, biomedical and agricultural industries (Zaman et al. 2014). Zinc oxide nanoparticles (ZnO NPs) are the most important synthetic nanoparticle that due to their specific properties increasingly used in variety of products such as cosmetics, pigments, electronic equipment, bioimaging, drug delivery, wastewater treatment, and environmental remediation (Liu et al. 2016; Lee et al. 2013; Xiong 2013; Osmond and Mccall 2010; Hsu et al. 2013; Xiong et al. 2011). Increasing application of ZnO NPs in different areas may enhance the potential risk of human exposure; therefore, it seems absolutely necessary to investigate the cytotoxicity effects of ZnO NPs especially in mammalian cells. It is suggested that nanomaterials are more toxic than their bulk counterparts. The mechanisms by which nanoparticles exerts their toxic effects are not well known, but some recent studies attributed it to their greater surface, permeability into cells, and accumulate within cells and organisms (Xiong et al. 2011), as well as, membrane damage, inflammation, DNA damage, apoptosis, and change in interactions between cells to cells and matrix (Abbasalipourkabir et al. 2015). Considerable research has been carried out to evaluate the cytotoxicity of nanoparticle in vivo and in vitro; in this regard, one of the most common recent mechanisms discussed in relation with ZnO NPs cytotoxicity is the increased production reactive oxygen species (ROS) (Guo et al. 2013). Overproduction of ROS by ZnO NPs, attributed to its small size, induces that DNA damage, cellular apoptosis, and activation of vital-signaling pathways include MAPK (Sharma et al. 2012). An attractive and new method to reduce the toxicity of nanoparticles is to synthesis it with green method instead of the chemical method. In this approach, the plant components are used for synthesis nanoparticles instead of chemical agents for reducing and capping (Jha et al. 2009). Green synthesis is more eco-friendly, safe, simple, nontoxic, economical (low-priced), efficient, biocompatible, and water soluble than chemical and physical method (Salam et al. 2012; Kim et al. 2011; Bala et al. 2015). A broad variety of plant extract are used for the biosynthesis of ZnO NPs including marine macroalgae Sargassum muticum (Azizi et al. 2014), Citrus aurantifolia, Parthenium hysterophorus, Aloe vera (Samat and Nor 2013; Rajiv et al. 2013; Gunalan et al. 2012), Poncirus trifoliate (Nagajyothi et al. 2013), Corymbia citriodora leaf extract (Zheng et al. 2015), Ocimum basilicum L. var. purpurascens (Salam et al. 2014), Aloe vera (Sangeetha et al. 2011), Parthenium hysterophorus (Rajiv et al. 2013), Astragalus gummifer (Darroudi et al. 2013), and Sedum alfredii (Qu et al. 2011). In addition to the current usage of marine algae in human food production, fertilization, phycocolloids, and cosmetic ingredients; some researcher applied it for nanoparticles synthesis (Azizi et al. 2014; Sahayaraj et al. 2012; Prasad et al. 2013; Singaravelu et al. 2007; Senapati et al. 2012). Sargassum muticum is large brown seaweed (macroalga) of the class Phaeophyceae that native to the northwest Pacific region (Milledge et al. 2016). A wide variety of potentially bioactive compounds were identified in Sargassum species including sulphated polysaccharides fucoxanthin, steroids, terpenoids, and flavonoids (Milledge et al. 2016; Yende et al. 2014). Sargassum muticum maybe have some biochemical properties due to its unknown components (Yende et al. 2014; Pomin 2014). In our previous report, we used the aqueous extraction of S. muticum for synthesis the ZnO NPs by green method (Azizi et al. 2014); S. muticum has been used to make various nanoparticles, including zinc oxide nanoparticles (Azizi et al. 2014), Magnetic Iron Oxide (Fe3O4) Nanoparticles (Namvar and Mohamed 2016), and gold nanoparticles (Namvar et al. 2015). The human exposure to ZnO NPs is undeniable, and it established that major target organ for ZnO NPs is the liver. Therefore, the primary aims of the present study were to evaluate the cytotoxic effects of green-synthesized ZnO NPs on human liver cells (HepG2) and its antiangiogenic effect by CAM method. The green synthesis of ZnO NPs was carried out according to a method described in our previous study. The data of characterization, SEM and optical analysis of ZnO NPs were published in our previous article (Azizi et al. 2014); in the current article, no relevant data are provided. In brief, the mixture of 2 g dried powder of S. muticum algae and 100 ml distilled water heated up to 100 °C and then was filtered by Whatman 41 filter paper. 50 ml of the aqueous extract algae was mixed with 10 ml of 2 mM of zinc acetate di-hydrate solution and the mixture was stirred at 70 °C for 3–4 h in an aqueous bath system to complete the reaction. The product was collected and washed several times using the centrifuge (4000 × rpm for 10 min); then, the ZnO–S. Muticum was dried at 100 °C for 48 h, and finally, the purified green-synthesized ZnO NPs were obtained by heating at 450 °C for 4 h (Azizi et al. 2014). The human liver cancer cell line (HepG2) was selected for the cytotoxicity study of green-synthesized ZnO NPs and obtained from the Iranian National Cell Bank (Pasteur Institute of Iran). Cells were cultured in RMPI 1640 medium (Sigma), pH 7.4, supplemented with 10% heat-inactivated fetal bovine serum (FBS) (Gibco), and 1% (w/v) antibiotic and antimycotic solution (Gibco) and incubated in a humidified atmosphere with 5% CO2 at 37 °C. The potential effects of ZnO NPs on viability of HepG2 cells were analyzed by trypan blue dye and MTT assay. This test was examined to determine the toxicity effects of green-synthesized ZnO NPs on viability of HepG2 cells. 100 μl/well medium containing HepG2 cells (5 × 103) were cultured, after 48 h cells were detached by trypsin. Equal volume of cells and trypan blue dye (10 μl) were mixed softly and the number of viable cells was counted. After seeding the HepG2 cells (1 × 106 cells/well) in 6-well plates for 24 h, ZnO NPs were added to the cells in different final concentration for 24 h. We performed the following sequential action: (1) the cells detached with trypsin and EDTA; (2) centrifugation at 750×g for 5 min; (3) washing the pellet cells with PBS containing calcium; (4) cells were re-suspended in 100 μl binding buffer; (5) cells were mixed with 2 μl annexin V-FITC; and at the end, (6) 2 μl PI was added to mixture and the flow cytometric analysis was done. After 24 h incubation of 1 × 106 cells/well of HepG2 cells in 6-well plates at 37 °C in a humidified CO2 incubator, treatment and control groups treated with 150 μg/ml ZnO NPs and 0.1% DMSO, respectively, for three timepoints (24, 48, and 72 h). Then, the cells were separated with trypsin and AO/PI dyes were added to suspension cells at an equal ratio (10 μl) and were examined under fluorescent microscope. 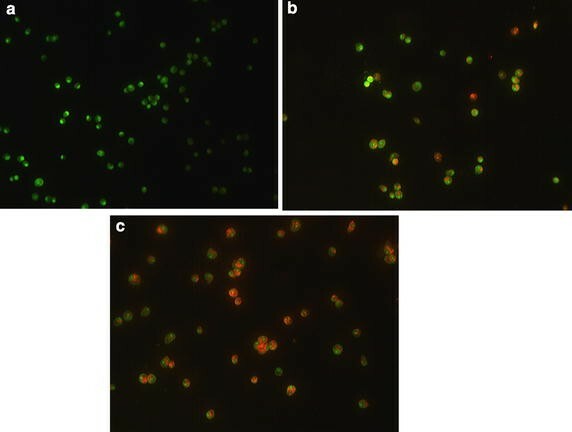 All viable and early apoptotic cells only uptake the AO dye which bind to double-strand DNA and emit green fluorescence, while PI stained the necrotic and dead cells and look red. 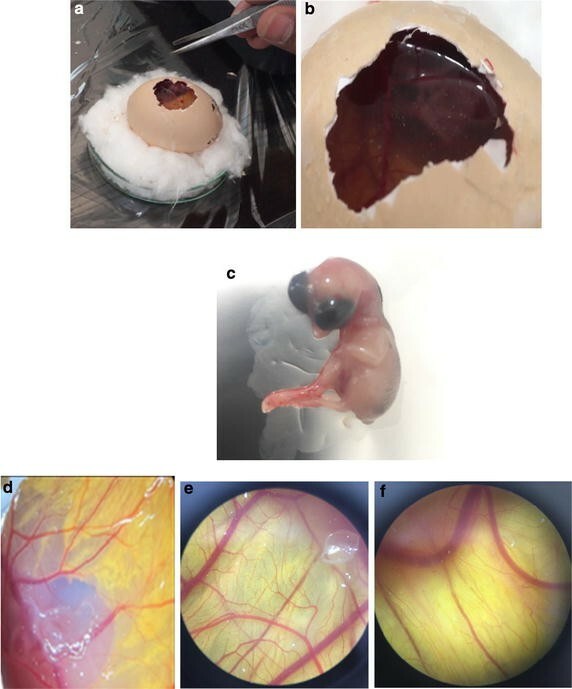 Among the standard methods for evaluating the effects of agents on angiogenesis, we selected the chick chorioallantoic membrane (CAM) assay. Briefly, forty fertilized Ross chicken eggs, purchased from Toos company (Iran), were carefully cleaned with 70% alcohol and randomly divided into four groups (ten eggs in each group); group 1 was control (without any treatment); and three other groups were experimented (groups 2, 3, and 4 treated with concentrations of 50, 100, and 150 µg/ml ZnO NPs, respectively). Then, the eggs were inserted in an automatic rotation Incubator at 38–38.5 °C and 55–65% humidity. After 48 h of the incubation (chick embryo development period), a 1 cm2 window was made in the shell under laminar flow hood, next, the windows were sealed using sterile paraffin and lamellas, and then, the eggs were returned to incubator until day 8 and rotated manually twice a day. On the 8th day of incubation, each specified group was treated with proper concentration of ZnO NPs under aseptic condition, and then, the windows were resealed and the incubation continued for further 72 h. At the day 12 of incubation, the egg shells were softly removed and CAM were carefully separated and examined with and without microscope. The stereomicroscope instrument was used to taking photo for analyzing the number and length of blood vessels. The photo was analyzed by Image J program. The Statistical Package for the Social Sciences (SPSS, V.18) was used to statistical analyses. The means of obtained data were analyzed using ANOVA and followed by Tukey HSD (honestly significant difference) test between groups. A P value of < 0.05 was used as the criterion for a statistically significant difference. All tests were performed triplicate and the results are expressed as mean values ± standard deviation (mean ± SD). The toxicity effects of green-synthesized ZnO NPs on viability of HepG2 cells were checked by MTT and Trypan blue assay. In trypan blue assay, the percent of viable HepG2 cells was calculated after 48 h incubation with different concentrations of ZnO NPs. The current research results demonstrate a concentration-dependent decrease in cell viability after 48 h exposure to ZnO NPs (Fig. 1). In the lowest concentration of ZnO NPs (175 μg/ml), more than half of cells remain survive (55.5%). In concentration more than 175 μg/ml, the viability of the cells was less than 40%. In the highest concentration of ZnO NPs, more than 95% of cells were dead and the survival rate of HepG2 cells was 4.5%. The growth inhibition of HepG2 cell was calculated in different concentrations (87, 175, 350, 700, 1400, and 2800 μg/ml) and times (24, 48, and 72 h) incubation with ZnO NPs by MTT assay (Fig. 2). The growth inhibition was increased in time- and dose-dependent manner. We observed that at the highest concentration of ZnO NPs (2800 μg/ml) after 72 h of exposure, more than 97% of HepG2 cells were died. The IC50 values were calculated 150 μg/ml at 48 h exposure time of ZnO NPs for both trypan blue and MTT assay. Our results show that green-synthesized ZnO NPs affected HepG2 cells viability even at low concentration. Table 1 and Fig. 3 present the results obtained from the AO/PI staining of HepG2 cells. From these data, we can see that ZnO NPs have time-dependent effects on cell viability. The results show decreased viability with higher apoptotic cells in all three timepoints (24, 48, and 72 h) of treatment with 0.1% DMSO and 150 μg/ml ZnO NPs. After 24 h treatment with DMSO viability of cells decreased to 93.7%, while, at the same time, the viability of ZnO NP treatment decreased to 70.9%. At 72 h, in DMSO treatment, the viability decreased to 87.3%, while, at the same time, the viability of ZnO NPs treatment decreased to 33.4%. The apoptotic effects of green-synthesized ZnO NPs were investigated by annexin V-FITC/PI dyes using flow cytometric analysis. Using of these dyes determines the cell viability in the following different mode viable cells, early apoptosis cells, late apoptosis cells, and necrotic cells. The results, as shown in Fig. 4d, indicate that a higher concentration of ZnO NPs increases apoptotic cells. Angiogenesis was evaluated by CAM assay. The angiogenesis indicators (number and length of the newly formed arterioles) were not significantly decreased in control and treated groups with 50 and 100 μg/ml concentration of green-synthesized ZnO NPs. The eggs treated with higher concentration of ZnO NPs (150 μg/ml) showed significantly reduction of vessel formation (P < 0.001) (Figs. 5, 6, and 7). Based on the results from CAM model, ZnO NPs at the highest concentration demonstrated significant inhibition of angiogenesis as compared with the control group. At the end of study, no significant changes was observed in chick morphology (both the CR and weight) in control group and treated group with 150 μg/ml (data not shown). Antioxidant activities of green-synthesized ZnO NPs evaluated by ABTS assay, relative to glutathione as standard group. Principle of this test based on quenching the long-lived ABTS radical cation (ABTS+) by antioxidant molecules. As shown in Fig. 8, the ABTS radical scavenging activities of green-synthesized ZnO NPs were dose-dependent and gradually increased. Maximum radical scavenging was observed up to 89% at concentration of 2800 μg/ml among different concentrations of 175, 350, 700, 1400, and 2800 μg/ml with EC50 600 μg/ml. Despite advances in diagnosis and treatment of cancers, it is still the second leading cause of death in the word; liver cancer is the fifth leading cause of cancer-related deaths worldwide (Siegel et al. 2017). Recently, cancer treatment and diagnosis were improved using different nanoparticles as nanocarrier systems, in both in vitro and in vivo research. Zinc oxide nanoparticle is one of the most interested nanoparticles applied as nanocarrier for cancer treatment as it is more cytotoxic to proliferative cells as compared to non-proliferative counterparts (Valdiglesias et al. 2013). The toxicological effects of chemical-based ZnO NPs have been investigated on wide variety of human cell lines include skin fibroblast (Dechsakulthorn et al. 2007) colon carcinoma LoVo cells (De Berardis et al. 2010), HepG2, A549, and BEAS-2B (Akhtar et al. 2012), A549 (Ahamed et al. 2011), and some primary rat cell lines (Akhtar et al. 2012), and a large number of other cells that not mentioned here. Akhtar et al. (2012) and Taccola et al. (2011) and a number of other researchers have noticed that ZnO NPs are cytotoxic only to cancerous cells and do not have any toxic effects on normal cell lines (Akhtar et al. 2012; Taccola et al. 2011). However, the cytotoxicity of some chemical synthesized nanoparticles has been confirmed on normal cells even at lower concentration in comparison of cancer cell lines; for this reason, green synthesis of nanoparticles becomes more attractive as an alternative method due to the decreasing biotoxicity effects of nanoparticles, through the use of non-noxious components instead of chemicals agent over the last recent years. The most used natural material to green synthesis of ZnO NPs is made up of plant extraction (Salam et al. 2014; Fu and Fu 2015; Nethravathi et al. 2015), fungi (Jain et al. 2013; Kundu et al. 2014), bacteria (Jayaseelan et al. 2012), algae (Azizi et al. 2014), and natural agents such as honey (Hoseini et al. 2015). The brown seaweed, S. muticum described at introduction, is also a selective plant to synthesis of nanoparticles. The S. muticum has several components which provides antimicrobial, anticancer, antioxidant, antiinflammation (Khan et al. 2008), anti allergic (Zuercher et al. 2006), and anti diabetic properties (Perez et al. 1998). This is assumed that nanoparticle synthesized by naturally components having high antioxidant activity is associated with more and more efficiency in reduction of toxicity in cells. Milledge et al. (2016) provided a description of potential use of seaweed in various disciplines (Milledge et al. 2016). Common antioxidant component found in S. muticum contain alpha and gamma tocopherol (Farvin and Jacobsen 2013), the carotenoid pigment fucoxanthin (Chae et al. 2013; Kumar et al. 2013; Wijesinghe and Jeon 2011), and other carotenoids and phenolic compounds (Milledge et al. 2016). In addition to antioxidant components, high amounts of fucoxanthin (as strong anticancer agent), carrageenan, alginates, iodine, agar, cytoprotection, phyco biliproteins, and many other important compounds such as essential fatty acids, sterols, and proteins result in pharmaceutical application of S. muticum (Milledge et al. 2016). The toxic effects of methanolic extraction of S. muticum have investigated by (Namvar et al. 2013); they demonstrated that despite being it toxic to cancer cell lines (MCF-7 and MDA-MB-231 cell lines) is not toxic to normal Vero cell line. They suggested that specific inhibition of cancer cell growth caused by signaling pathways activated by ligand/receptor interaction. The ligands in natural material are probably presented at the surface of nanoparticles which can attach to specific receptors and trigger the downstream signaling cascade leading to cell death in cancer cells (Harada et al. 1997). Recent evidence suggests that polysaccharides are the primary component of seaweed having anticancer activity (Holdt and Kraan 2011). Cytotoxicity of nanoparticles routinely went through by the trypan blue and MMT assay. In this study, we pointed out that ZnO NPs were found to cause reduction in HepG2 cells viability even at the lowest concentration by trypan blue assay. Green-synthesized ZnO NPs inhibits cell growth in a concentration-dependent manner (87–2800 μg/ml) leading to cell death in HepG2 cell line after 48 h incubation. The cytotoxic effect of ZnO NPs is clearly supported by the current findings of MTT assay. Time- and concentration-dependent decrease in cell viability was observed by MTT assay. In the present study, median lethal concentration (IC50) value of green-synthesized ZnO NPs was calculated 150 µg/ml at 48 h exposure. This finding is broadly in agreement with earlier studies (Dhamodarana and Kavithab 2015), which used the aqueous leaf extract of Andrograohis Paniculata to green synthesis of ZnO NPs. They observed the maximum anticancer activity of ZnO NPs against HeLa and Hep-2 cell lines at 250 µg/ml. Namvar et al. (2015) who demonstrated growth inhibitory effects of green-synthesized ZnO nanoparticles on 4T1, CRL- 1451, CT-26, and WEHI-3B cell lines by dose- and time-dependent manner (Namvar et al. 2015). They also showed that ZnO NPs have no cytotoxicity on normal mouse fibroblast (3T3) cell line (Namvar et al. 2015). This finding is in agreement with Valdiglesias et al. (2013) findings, who exhibited that exposure to chemical-based ZnO NPs significantly decreased the percentage of viable SH-SY5Y cells by dose-dependent manner at all interval times (Valdiglesias et al. 2013). Treatment with ZnO NPs led to reduction in viability of other cell lines, in a concentration-dependent manner, consists of A431 (epidermal carcinoma) (Sharma et al. 2009), U87 (astrocytoma) (Lai et al. 2008), HepG2 (human liver cancer) (Sharma et al. 2012), and A549 (lung carcinoma) (Fukui et al. 2012) cell lines. The results of Wahab et al. (2014) supported also the previous results that ZnO NPs decreased proliferative cell viability in concentration-dependent manner (Wahab et al. 2014). In other study, Namvar and Mohamed (2016) used the aqueous extraction of S. muticum to synthesis the magnetic iron oxide (Fe3O4) nanoparticles. They confirmed its antimicrobial activities against six microorganisms (Listeria monocytogenes, Escherichia coli, and Candida species) (Namvar and Mohamed 2016); likewise, Namvar et al. (2014) confirmed anticancer activity of iron oxide nanoparticles against Jurkat cells, MCF-7 cells, and HepG2 cells (Namvar et al. 2014). Induction of apoptosis and necrosis in HepG2 by ZnO NPs was investigated using dual-staining AO/PI. Table 1 compares the results obtained from the preliminary analysis of AO/PI staining. Green-synthesized ZnO NPs decrease HepG2 cell viability by apoptosis induction in time-dependent manner. As well as, Fig. 3 reveals that there are marked increases in cell death after 48 h incubation with ZnO NPs, under the fluorescence microscope. It can be seen from the data in Table 1 and Fig. 3 that ZnO NPs induces apoptosis in HepG2 cells. Subsequently, the flow cytometric method was done for analysis of apoptosis by dual-staining annexin V-FITC/PI. At the first stage of apoptosis process (early apoptosis), phosphatidyl serine (PS) translocated from inner to outer layers of plasma membrane; annexin V attached to PS with high affinity and makes it possible to detect early apoptosis in cells (Martin et al. 1995; Koopman et al. 1994). Figure 4 shows analysis of apoptosis in HepG2 cells treated with different concentrations of ZnO NPs. As can be seen from Fig. 4d, increasing percentages of apoptosis were observed in HepG2 cells. This finding confirms the cytotoxic effects of green-synthesized ZnO NPs on human liver cancer cell line (HepG2) by induction of apoptosis. The findings observed in this study mirror those of the previous studies that have examined the apoptotic effect of nanoparticles in different cell lines; Nagajyothi et al. (2016) showed that green-synthesized copper oxide nanoparticles induce apoptosis in human cervical carcinoma cells (HeLa cells); Kulandaivelu and Gothandam (2016) showed that biosynthesized silver nanoparticles increase apoptosis pathway in MCF-7 cell line (Kulandaivelu and Gothandam 2016). The study has also confirmed the findings of Namvar et al. (2014) which found that iron oxide nanoparticles induce cell cycle arrest and apoptosis in Jurkat cells, MCF-7 cells and HepG2 cells; similarly, Wahab et al. (2014) were found that ZnO NPs result in cell death by induction of apoptosis in HepG2 (liver cancer) and MCF-7 (breast cancer) cancer cells (Wahab et al. 2014). These results agree with the findings of other studies, in which cell cycle arrest is the preliminary event of cell death triggered by ZnO NPs in wide variety of cell lines such as SHSY5Y cells and neuronal Schwann cells (RSC96) (Yin et al. 2012), MCF-7, and HepG2. However, the findings of Valdiglesias et al. (2013) study support the previous research and confirm that mitochondrial-independent pathways are involved in cell death induction by ZnO NPs (Valdiglesias et al. 2013). Since the angiogenesis is a critical step in cancer development and metastasis, many efforts have been made to inhibit this process. Nanotechnology also has entered in this field, different nanoparticles synthesis and used to inhibit angiogenesis, but obtained results were varied. Both antiangiogenic and proangiogenic properties of nanoparticles have been seen in research. Mroczek-Sosnowska et al. (2015) showed that copper nanoparticles have proangiogenic effects that their results in line with the previous results of Kang et al. (Kang et al. 2011); they reported that polyvinylpyrrolidone-coated silver nanoparticles induce angiogenesis. However, in contrast to these findings, the majority of studies focused on the antiangiogenic effects of nanoparticles, gold NPs  (Kalishwaralal et al. 2011; Arvizo et al. 2011), Ag NPs (Gurunathan et al. 2009), perflurocarbon nanoparticles (Das et al. 2013), carbon allotropes (Grodzik et al. 2011), etc. Our results were in line with latest group of articles that nanoparticles inhibit angiogenesis. In the present study, green-synthesized ZnO NPs decreased angiogenesis in chick chorioallantoic membrane. ZnO NPs at the highest concentration demonstrated significant inhibition of angiogenesis as comparing with control group. The chick morphology had no significant changes. In this investigation, the aim was to assess the cytotoxic effects of ZnO NPs on HepG2 cells; as well as the antiangiogenic effects of ZnO NPs was evaluated. Current research results confirmed that ZnO NPs have apoptotic, antiangiogenic, and cytotoxic effects at all concentration and time of incubation. In general, therefore, it seems that it may be used as a supplemental drug in cancer treatment for decreasing angiogenesis and induce apoptosis. Finally, an important limitation needs to be considered that the current study has only examined in vitro toxicity tests methods for ZnO NPs; it is recommended that further research be undertaken in vivo. ZS carried out the all cytotoxicity of nZnO, Trypan blue assay, MTT Assay, and Apoptosis Assay. IJ carried out the Chick chorioallantoic membrane assay, Antioxidant Activity by the ABTS+ Assay, and Statistical analysis. FN carried out Synthesis, Characterization, SEM and optical analysis of ZnO nanoparticles. Each authors contributed to the writing of this article. All authors read and approved the final manuscript. The authors have been participated in the preparation of the manuscript, and have given their permission to submit this manuscript with its present format. The study protocol was approved by the ethics committee of the Faculty of Pharmacy, Shahreza Branch, Islamic Azad University, Shahreza, Isfahan, Iran.